Last week, Greece received $17 billion from its creditors, representing the final installment of the country’s third bailout since 2010. There’s no doubt the Southern Mediterranean country has endured a lot of pain over the last eight years. To revamp their economy, the Greeks cut back on public pensions, increased taxes, and swept away some of their debt overhang. After watching their GDP fall by as much as 25% from pre-recession levels, the Greek economy has grown over the last two years and the government has posted primary (meaning before debt payments) surpluses. That’s awesome, but it’s not enough. This is a tragedy that seems to have no end. The Greeks and their creditors claim the bailout can end because the ailing country has mended and has a sustainable path. But the details tell a different story. To make the numbers work, the Greek creditors gave the country a short-term pass on much of its debt, which includes a 10-year extension on previous loans, and a 10-year moratorium on interest and amortization. Essentially, Greece is OK as long as it doesn’t have to pay back very much. But even that’s not a sure thing. Greece must run a primary budget surplus of 3.5% until 2022, and then a 2.2% primary budget surplus after that. As a refresher, NO ONE does that. Maybe a country, like Germany, runs a bit of a surplus for a year or two. Maybe a country, like Australia, runs a decent surplus for years. But a 3.5% surplus for several years, followed by 2.2% indefinitely? And this in a country with 20% unemployment, a difficult workplace environment, few exports and an aging population. To make matters worse, Greece is starting behind the eight ball. The country currently carries 180% of debt-to-GDP, and has raised taxes to the point that it’s driving the economy back underground. Starting this year, professionals earning 5,000 euro per month, about $5,500, must pay 75% in combined taxes and security contributions. That income level is a mere $66,000 per year, which is decent, but not excessive. Imagine if three out of every four dollars you made had to be sent to Uncle Sam. In 2016, non-performing loans made up just over 50% of all loans in Greek banks. That number dropped to 43% earlier this year, and the ECB wants to see bad loans at 35% by the end of 2019. But that still means that more than one-third of all loans in Greek banks aren’t performing! With capital ratios at a generous 10%, the Greek banking system remains dead broke. Not everyone is blind to the situation. The IMF refused to participate in the last few rounds of lending to Greece, noting that without more loan forgiveness the country couldn’t pay its debts. Everyone knows this, but the other lenders – the European Commission and the ECB – have bigger problems. They can’t ask investors holding Greek bonds to take a haircut because those investors include other central banks in Europe as well as some of the largest private banks, all of which have their own capital problems. As long as they keep the debt on their books, even if they allow Greece to take 100 years to repay it, they can claim that the debts are in good standing. It’s a game of musical chairs. When the music stops, not everyone will have a seat. 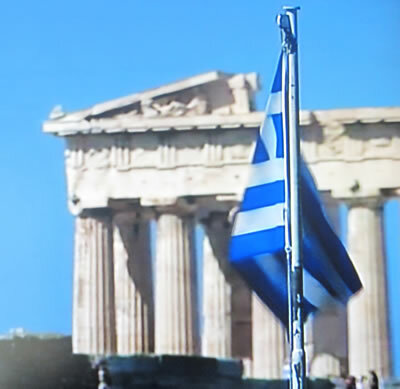 When the Greek economy finally breaks down, it’s possible the country will finally call it quits on the euro. When that happens, even the ECB will have to admit that this is a tragedy, not a triumph. He just bagged a 430% gain in the service, so now’s the perfect time to hear what he has to say. Click here to for more information and to sign up for free. Copyright © 2018 Rodney Johnson - All Rights Reserved Disclaimer: The above is a matter of opinion provided for general information purposes only and is not intended as investment advice. Information and analysis above are derived from sources and utilising methods believed to be reliable, but we cannot accept responsibility for any losses you may incur as a result of this analysis. Individuals should consult with their personal financial advisors.